Excellent indoor/outdoor flow between the open plan living area and the terrace. Relax on the couch and watch some Netflix, or just enjoy the views of the city. Heatpump/Aircon helps keep the apartment the perfect temperature. Prepare a feast in the compact but fully equipped kitchen. You are located on the top floor of the apartment building. 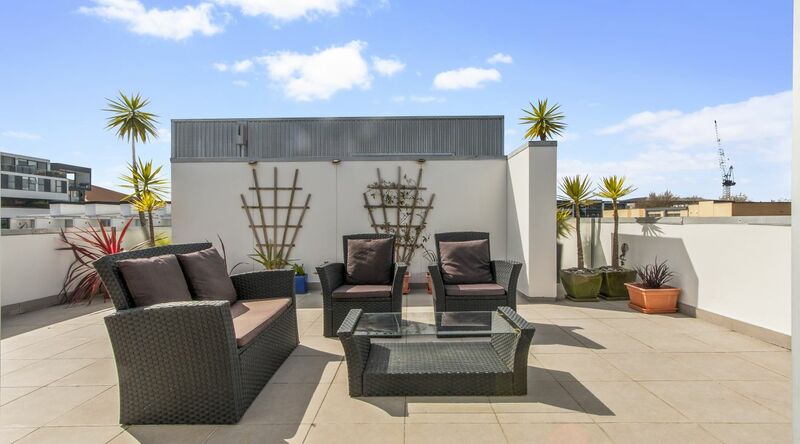 This apartment is located in the award winning Beaumont Quarter has panoramic views of the city, a large deck that gets all day sun and open plan living area & kitchen, 1 bedroom, 1 bathroom and a carpark. There is great indoor/outdoor flow between the open plan living area and large deck that gets all day sun. Morning or afternoon, the deck is a great place to relax in the sun. 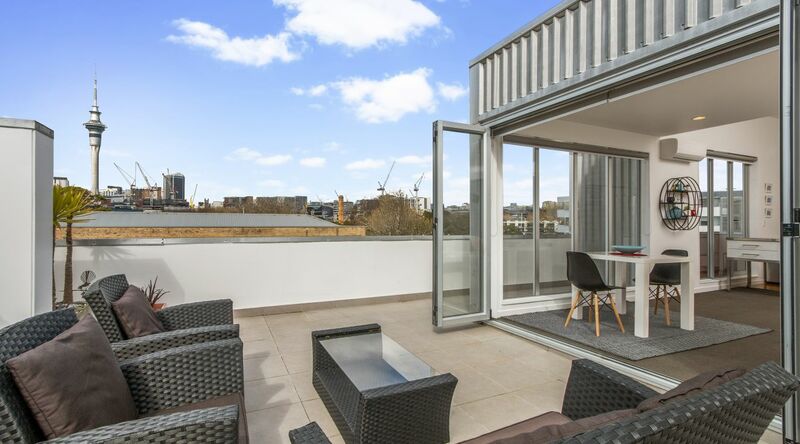 High ceilings and an abundance of natural light through the north-facing floor-to-ceiling bifold glass doors make this a light and airy, spacious apartment, with fantastic views of the city skyline. This apartment is on the top floor of the building, so you'll need to make your way up the stairs. Being on the top floor is great, as you'll receive heaps of sun and no noise from people above you. Even though private and elevated, the apartment is located in a central city neighbourhood, so you will be surrounded by buildings and other residents. That’s not a downside, since the neighbours are generally a very considerate group of people, but you will be aware of their presence on occasion. Most people actually love it, since you will have a chance to meet locals and quickly strike up a conversation. Live like a local amongst locals and you will love your stay. Sit back and relax in style on the comfortable sofas while watching Netflix on the 43" HD Smart TV or listening to some music on the stereo system (Bluetooth, CD player or radio). The wifi is connected to an unlimited high-speed 100 Mbps fibre internet connection. Our fully equipped kitchen with dishwasher, hob, oven and fridge/freezer includes chef-quality stainless steel gourmet cookware and good quality knives. We've supplied a Nespresso machine and milk frother for coffee aficionados, and a classic teapot so you can brew the perfect cup of tea. The queen size bed comes with a wool all-seasons duvet, high thread count sheets and a selection of soft, medium, hard and feather pillows. Free secure parking for one car is provided in a space located below the apartment building. There is direct access to the apartment from the car park to the apartment via a stairs. There are plenty of bicycle racks located inside the secure underground parking.